Panic, the fine folks who brought us Transmit, have produced Stattoo, which looks like another winner. Since I am at work I can't try it out, but when I get home I will download and it and post my thoughts. My intial impression is - neato. However, I don't see any documentation about creating your own capsules, of course it just came out, and I haven't even tried the freakin' thing yet. All in due course, sir. The moment when you start pondering whether you have been watching too much HGTV is when you start to think about what kind of house you would like to live in; knowing full well that you won't be moving into a house any time soon. Didn't their parents tell them to never take candy from strangers? And didn't their sys admins tell them to never give out their passwords to strangers? Over all, very sad indeed. The New York Times > Week in Review > Your Password, Please: Pssst, Computer Users . . . Want Some Candy? The survey was something of a publicity stunt staged by the organizers of Infosecurity Europe 2004, an information-technology conference held in London last week. It was hardly scientific; only 172 people were polled, and it was not verified that people were offering up an actual password. But among computer experts, even this informal exercise pointed out a persistent truism: that for the millions of dollars corporations have spent on erecting firewalls and installing expensive intruder-detection systems on their networks, the weakest link in any system remains the ordinary, well-meaning but hopelessly gullible user. We grow delicious software. Simple and beautiful with surprises and detail that you would never expect from software. It's delicious and it makes you smile. 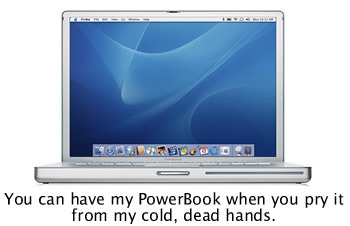 It brings your computer to life and into your life. I have no idea what this company is going to do, but I like their name and their website. Keep on rockin, Delicious Monster! Provide your students with the best legal solution to manage, acquire, and listen to music by participating in the iTunes on Campus program. This program provides an institutional site license for iTunes and materials you can use for student communications. The program is easy-to-administer and is free. This looks like little more than marketing fluff to get Universities to distrubute iTunes to their students. Not sure it will work. Movie and Music Trailers still download to the same location (/tmp/501/TemporaryItems/QT…), which is nice. It makes it very easy to grab music videos and now trailers. I don't know that I care too much, but it will save me a trip to Sherlock and/or Safari I suppose. You learn something new every day. Now I can save all other neato Quicktime files for my very own. "No one installs it, yet this garbage is on so many machines. Obviously the spyware fairy shows up late at night and installs the junk on their systems," said Keith Hitchens, who maintains networks for several clients, including a Manhattan public relations firm and a magazine-publishing busines. The spyware fairy visits my office fairly frequently. However, when I started working there almost everyone was an administrator of their machine. I changed that policy, so that helped a bit. 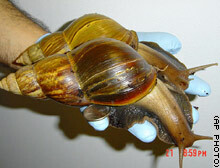 Those are two freakin big snails. And they are illegal! Read all about it here. "hmmm...maybe i scoffed a bit sooner than i should have. maybe i should give getting out of bed at a reasonable time a chance." Since we are trying out a new schedule at work I am working 8am to 4pm, so I can relate. I have to wake up at 7am! No one should be awake that early, if you ask me. Automatic WMA to AAC conversion, enabling Windows users to automatically create iTunes versions of their songs encoded in unprotected WMA. Converting an entire music library into iTunes and syncing it onto iPod™ is now a snap. Gmail Gems is a blog with tips about Gmail for all you bastards that have a Gmail account. Who wants to invite me to join? Begging worked for orkut, so why not for Gmail? There are two things every administrator wants out of an operating system: security and stability. While security has received a lot of attention in the past year, we tend to leave the stability part completely to Microsoft. After all, when have you ever seen a stability checklist? The plain truth is, many system instabilities are preventable. While operating system bugs do exist, there is a lot that administrators can do to improve the overall availability of their servers and workstations. While this article has no astounding tips, it isn't overly obvious either. Definitely worth a scanning. LONDON, England (AP) -- David Bowie has invited fans to bootleg his music -- and he's offering prizes for the most creative theft. The musician's Web site urges fans to mix classic Bowie songs with material from his latest album, "Reality," to create a "mash-up" -- a track that uses vocals from one song superimposed over the backing tracks of another. Even though he is pretty scary looking, he is one cool cat. Anyone have any idea why Billy Joel drives a car like the one in that picture? Is he practicing for a career as a clown? Come on Billy, you have lots of money, get a bigger car! Brin noted that he was "embarrassed" that Gmail's beta doesn't support Safari, but said that they will add Safari support before its public release. "We're going to make it work with Safari and that's one of the high priority things," Brin told MacCentral. "I’ve heard that you can sort of get it to work if you're desperate. I want to fix that, and I want to make it work really well." I am glad to see this, since I do plan to get a Gmail account (anyone want to invite me into the beta? Thanks.) when I can, and Safari is my browser of choice. difference between them, and how do you decide which one to use? usage compare to the above. Thank you. I am interested in setting up Replication for our database, so I thought I would like to this Ask Tom article. Where have all the Macs Gone? Stroll the corridors and the atriums on Apple Computer's corporate campus these days and you will notice that something is missing. Gone are the posters and graphics accenting the company's sleek personal computers. In their place, in the main lobby, is a striking, three-story-high billboard celebrating Steven P. Jobs's brand-new billion-dollar consumer electronics business - the iPod digital MP3 music player. All that iPod money is going to Steve's head. Next thing you know he won't be a pleasure to work for and he will lose he well deserved Mr. Nice Guy reputation. Since the weekend is now at an end, I am going to tell you all what I did. The short version: not much. On Friday I came home and watched American Wedding, which had a couple of funny moments, but overall it wasn't that great. But I did watch the unrated version, so I got to see some boobies. Saturday I realized I needed to get out and run some errands, specifically I needed to get a suit. Having just received a gift certificate in the mail from Boyds for $100 off a suit of $500 or more I thought I would check them out. I must point out that I love men's departments in stores like Boyds. The staff there are usually old men who have been working in Menswear for longer than I have been alive, and to top it off Boyds has a very nice Big and Tall shop. I rode the elevator up to the fourth floor, got off and was greeted by 3 salesmen. I said, to no one in particular, "I need a suit" and was directed to Tom. Tom looked at me, asked me what kind of suit I was looking for (dark pin stripes) and had me try one a coat in less than 2 minutes. I didn't like it, and it didn't fit so he took it off of me and get me a second jacket which fit like, well like a jacket. I tried on the pants, Tom beckoned for the tailor to come over, he marked it up for alteration and I was done. Less than 10 minutes and I had spent $700 on a suit (and yes that includes the $100 discount). However, it isn't that bad since this will be my second suit, and I figure if you are going to get nice clothes you should get nice clothes. It is a Burberry and I will take some pictures of me in it, if anyone really cares. I left Boyds and went to Barnes and Noble, which I recounted elsewhere, and then went home and watched Trading Spaces and read a book that I had purchased. Today I watched Life is Beautiful and spent most of the day and night being lazy. Mystery surrounds the death of a leading Sherlock Holmes expert who was found in his bed garrotted with a shoelace and surrounded by cuddly toys. Westminster Coroner's Court heard that Richard Lancelyn Green, 50, who had devoted his life to studying Sir Arthur Conan Doyle's fictional detective, had suffered a "very unusual death". A wooden spoon had been used to tighten the shoelace around his neck. No matter if you love or hate reality TV, you must read this idea for a new show. Interestingly, Warren Buffet went to both Wharton and Columbia Business School, but he only graduated from Columbia. The author of "Cryptonomicon" and the "Baroque Cycle" talks about the brighter side of Puritanism, the feud between Newton and Leibniz, and the literary world's grudge against science fiction. I haven't read this interview yet, but I plan to. I like Stephenson's writing, but I always thought he was trying to hard to be 'cool,' however, when I went to see him speak last year I found out I was off base. So, Neal, if you are reading this I am sorry, you are good people.